B.C. journalists reported Lowe’s stupendous spin job as if they lack any critical faculties. If anyone in British Columbia needs to re-brand his reputation, it’s Stan Lowe. The police complaint commissioner has consistently supported crimes against women, even in one case a disabled woman, provided the crimes are committed by cops. But his handling of the Frank Elsner case must deeply bother Lowe. He’s previously been complacent in his knowledge that the province’s political, legal, media and “activist” establishment always backs him to the hilt. This time he’s gone to great lengths to rationalize his four months of inaction regarding the former Victoria police chief. With great media fanfare, Lowe released a 59-page report that blames two mayors for his inexcusable delay in ordering a Police Act investigation into Elsner and, evoking dark humour, portrays himself as a crusader for justice. Even more preposterously, he claims that role when the victims are female. Lowe’s spin-and-smear job shows further absurdity in its dozens of references to “public trust,” along with frequent mention of “transparency” and “accountability.” Those are all qualities sorely lacking in Lowe’s organization, which hides its ethical corruption under the secrecy and immunity granted to these characters under B.C.’s Police Act. But besides Lowe’s repeated efforts to offload blame for his delayed investigation, he’s most outrageous in pretending he stands up for women. His track record, especially when women are the victims, demonstrates otherwise. That’s discussed below. Even so, his strategy worked. The media fell for it. He described the penalties imposed on Elsner as unprecedented. That would also describe the amount of info Lowe made public. But that wasn’t for the cause of accountability, a concept verboten to Lowe and his crew. It’s an elaborate work of self-promotion that deflects attention from Lowe’s four-month delay in ordering a Police Act investigation. Unfortunately for Lowe’s integrity, that kind of delay is anything but unprecedented. Six days later the province announced Lowe’s appointment as head of B.C.’s Office of the Police Complaint Commissioner. Last week’s media coverage transcribed Lowe’s remarks unquestioningly and overlooked his tactics. Lowe’s office learned about allegations against Elsner in late August 2015. Lowe didn’t order a Police Act investigation until December 18, about four months afterwards. What happened in the meantime? Lowe chose to let the Police Board co-chairs, Victoria mayor Lisa Helps and Esquimalt mayor Barb Desjardins, handle the matter under an internal discipline process. Lowe could have—and should have—ordered a police investigation under the Police Act. Two dramatic developments finally convinced Lowe to end his cover-up. Given that Elsner’s female victims were police officers, the Victoria Police Union called for his dismissal. That meant covering up for Elsner no longer kept Lowe on the cops’ side. Soon after that, media publicized the case. Lowe’s lawyer responded vaguely about 20-20 hindsight. Evidently Lowe intends this report to be the definitive answer. But it reads like a professionally written propaganda piece. Moreover his accusations against the mayors have been disputed by Desjardins and Helps. Unfortunately for the two mayors, most of the media coverage originated with the Times Colonist, which for more than a decade has almost consistently refused to print anything but favourable content about the OPCC. The TC’s coverage of Lowe’s spin-and-smear job began as entirely one-sided, eventually becoming merely lop-sided. Lowe’s record shows he should be the last person to accuse others of covering up cases involving female victims. Lowe should be the last person to accuse others of obfuscation. That’s a regular OPCC tactic, as is outright lying. Not only does Lowe pile blame on the two mayors, but he contradicts himself by emphasizing their unsuitability to handle such matters. Understandably the mayors have limited experience with police issues and possibly none with investigations. Lowe has held a much more narrowly focused job for nearly 10 years. He has the sworn duty under the Police Act and the greater responsibility. Yet he didn’t act on it until Victoria cops made their position clear and media publicity resulted. That brings to mind the case of Vancouver constable Taylor Robinson, who shoved a disabled Indigenous woman to the sidewalk for no apparent reason. A November 2013 OPCC document shows that the incident happened on June 9, 2010, and came to the attention of the VPD that evening. Lowe’s agency learned about the incident on June 28, but from the victim, not the VPD. 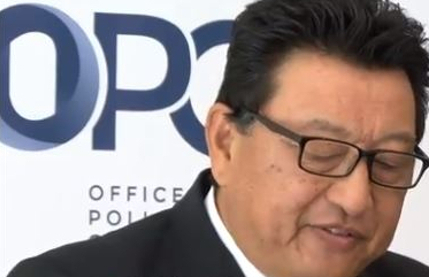 VPD Professional Standards officers failed to inform the OPCC, contrary to the Police Act. But Lowe failed to order a Police Act investigation until July 27. That was nearly seven weeks after the VPD learned of Robinson’s actions and over four weeks after the OPCC learned about the incident. Not noted in the OPCC document, Lowe ordered the investigation just days after the media found out. Lowe has never explained that very disturbing delay, let alone try to spin it in a 59-page report. Duty required Lowe to order an immediate investigation not only into Robinson, but also into the VPD Professional Standards officers who hid the incident from the OPCC. Lowe’s credibility hasn’t been helped by OPCC spokesperson Rollie Woods, a former head of VPD Professional Standards. He has lied to the media at least twice on important aspects of the Robinson case. There’s no truth to that statement. Lowe ordered the hearing into Robinson’s actions and Robinson’s actions only. It’s worth outlining the procedure that Lowe’s lying spokesperson overlooked. Before calling a public hearing into the VPD Professional Standards officers, Lowe would have to order a Police Act investigation into those officers. Then Lowe would have to release a Notice of Public Hearing that names the officers and details the allegations against them. Lowe did none of those things. His staff even rejected my formal complaint that requested he order an investigation. Woods’ statement was so egregiously dishonest that it called for a retraction. Yet none came, even though Woods speaks on behalf of (and therefore lies on behalf of) Lowe, an independent officer of the legislature. Again, that’s completely false. My concerns didn’t even come up at the Robinson hearing, let alone get debunked. Still, no retraction came from the OPCC about an obvious whopping lie from Lowe’s spokesperson. Those developments go back a few years, but they constitute an important part of the OPCC’s legacy. Maybe Lowe’s trying to counteract that legacy with his Elsner report. It seems to portray Lowe as a crusader for justice, especially when the victims are women. So let’s look at his handling of another case, again with a female victim. New Westminster police officer Sukhwinder “Vinnie” Singh Dosanjh faced both Police Act and Criminal Code investigations in July 2008 on allegations that he illegally entered a woman’s house and assaulted her while off duty. In spite of the OPCC’s usual secrecy, some details surfaced in the New Westminster Record. According to the paper, the Crown dropped all charges against Dosanjh but a judge took the unusual step of imposing a peace bond ordering Dosanjh to report to a probation officer, have no contact with the woman involved and possess no weapons off duty. The Record also revealed that Dosanjh faced additional allegations, including an off-duty firearms offence, which were investigated under the Police Act but not under the Criminal Code. Following the Police Act investigation the New Westminster force imposed a temporary demotion on Dosanjh and ordered him to take retraining and psychological counselling, the Record stated. He returned to work after a suspension of three years and seven months on full pay. The seriousness of the charges, the leniency of the penalty and the very lengthy period of time off with pay must surely have required Lowe to order a Public Hearing under the Police Act. Those decisions are part of his duties as commissioner. Yet the OPCC “signed off on the matter,” New West police told the Record. Again, those events date back a few years, but they’re still relevant. That’s especially true because just last year, in August 2017, Victoria police arrested Dosanjh for an alleged sexual assault dating to 2005. In addition to the Criminal Code investigation, Dosanjh faced another Police Act investigation conducted by police under Lowe’s oversight. How that investigation has progressed or concluded hasn’t been revealed, thanks to the OPCC’s lack of transparency. B.C. and Quebec, by the way, are the only two provinces that allow cops to investigate other cops for sexual assault. In the rest of Canada, civilian agencies investigate those cases. That leads to another part of Lowe’s report. He argues the need to amend the Police Act to transfer responsibility for disciplinary measures involving police chiefs from Police Board chairs to retired judges. That’s a sound recommendation even if it’s calculated to reinforce his blame diversion. But it also shows that Lowe can take an advocacy role, something he hasn’t previously bothered with during his decade on the job. We need much stronger advocacy than that. We need a thorough overhaul of B.C.’s Police Act to bring transparency and accountability to the OPCC, a manifestly corrupt agency that operates in near-secrecy and in practice answers to no one. We also need a thorough overhaul of the OPCC’s staff to purge manifestly corrupt characters like Lowe and his manifestly corrupt crew.